4 Megapixels? But iPhone has a 2MP cam, how’s that possible? 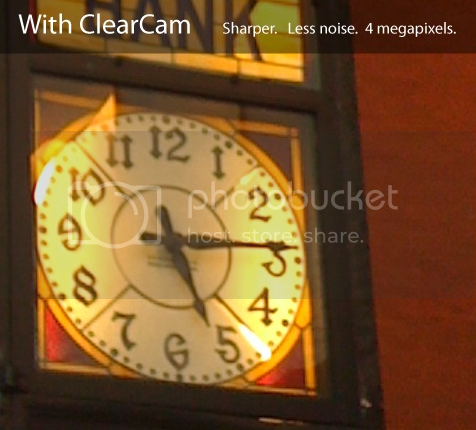 Well, there’s an app known as ClearCam which is capable of turning your iPhone’s camera into a pro cam. So how does it work? It stitches up multiple photos taken from the 2MP camera of your iPhone, and produces a single 4MP shot. It has an enhanced mode which takes 6 pics in rapid succession; the pics are later combined and enhanced to make them look a lot better than the default pics. The app also features a QuickShot mode with which you can capture 4 pics in one shot. Unfortunately ClearCam is not available on Apple’s App Store as its enhanced mode doesn’t comply with Apple’s SDK rules. But don’t you worry! If you liked it you can grab if off Cydia on your jailbroken iPhone.